The season kicked off 10/17 as our PromoShop LA office delivered its first round of meals to those in need in the Culver City area. PromoShop has adopted a route with the Culver PalmsMeals on Wheels program, where once a week, two or three employees work together to deliver meals. PromoShop Employees headed out to drive the Meals on Wheels route. With Thanksgiving and the holidays fast approaching, PromoShop wanted to take time to celebrate our office community, while also taking the opportunity to give thanks. 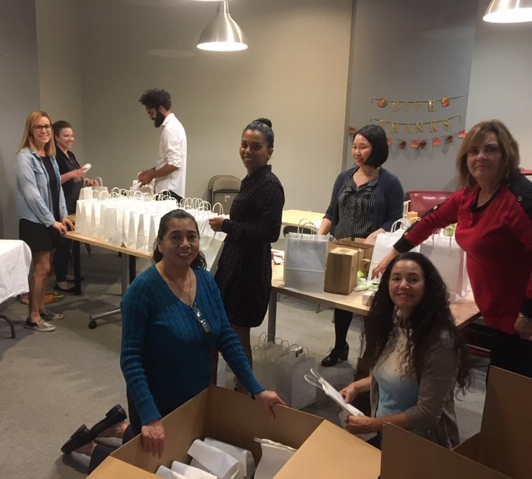 Last week, At our First Annual Friendsgiving Luncheon, team members helped assemble Get Well Kits which were donated to the Meals On Wheels program. Included in the kits were lip balm, lotion, soap, hand sanitizer, tissues and a pair of socks. Our continued work with Richstone Family Center’s Adopt-a-Family Program during the holidays is a bright and shiny opportunity for us all to give from our hearts. Each holiday season for the last few years we’ve worked together to help a struggling family with a traditional Thanksgiving meal and a happy Holiday by hosting a food and present drive. This year we are fortunate to be paired with Vanessa’s Family. Vanessa is a single mother with a son and 3 nephews ages 1, 2, 12 and 14. The food collected for Vanessa’s family filling two large boxes. PromoShop is thankful to have the opportunity to give back to our community and work with both the Meals on Wheels Program and the Richstone Family Center. The holidays are a great time for us all to practice thoughtfulness and grace in helping those who may not be doing so well in whatever capacity we are able to help. With thankfulness in on our minds, we want to let you know that we are grateful for all of you, and wish you a Happy Thanksgiving!